Shanghainese restaurant from Tony Hu. It's often said that that China's largest seaport doesn't have a cuisine of its own but borrows liberally from surrounding areas. Still, it's true that that the Shanghainese are fond of cooking with sugar, alcohol, and vinegar, and they make particular use of "red cooking," in which meats are braised slowly in soy sauce. You find all of those characteristics represented on the menu at Lao Sze Chuan owner Tony Hu's Shanghainese project, but the measure of its success will be the consistency of the xiao long bao, or steamed soup dumplings, which for some reason are notoriously difficult to reproduce outside of China. Either the dough is too thick, the filling is poor, or—most commonly—there's no soup inside at all. At times Lao Shanghai's dumplings suffer from thickness, but at least every one I've eaten actually contained soup (though not enough). Otherwise, the "eight precious stir fried in hot sauce" was particularly good, uniform dice of pork, vegetables, and tofu cooked with peanuts in a spicy-sweet black vinegar. The Shanghai-style fish fillet, in a thick, bland sauce with wood ear mushrooms, was unimpressive to gaze upon, but the fish was terrifically silky and fresh, contrasting nicely with the crunchy fungus. Braised pork belly in preserved bean curd sauce, a bright orange-red shimmering blob made in the aforementioned red cooking style, was tender enough to be baby food and deceptively subdued in comparison to its treacly appearance. Shanghai rice soup—a sweet wine-based hot broth with soft rice and balls of rice gluten—makes a nice finish. 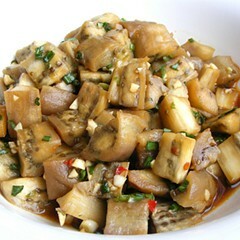 Other seminal Shanghainese dishes available include stir-fried eels, drunken chicken, and steamed or deep-fried buns. Want to get your waiter's attention—or the entire restaurant's? 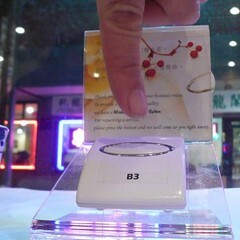 Press the handy buzzer provided on each table.